Our 2015 2016 2017 Chevrolet Corvette Z06 Z07 Stingray C7 Stinger Hood Carbon Fiber Decals are produced to exacting standards. 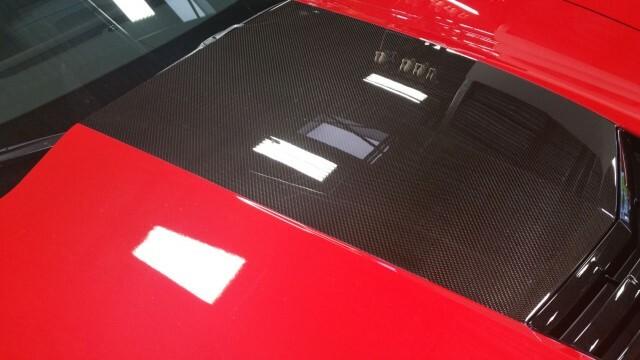 Save $1,995 off GM exposed carbon fiber hood option B92 and still get the same appearance with this hood decal stripe. Our Stinger Hood decals are made to meet or exceed OEM stripe/decal standards. American-made pride is incorporated into every decal kit. You deserve the best product on the market. Our C7 Z06 or Z07 Stinger Hood Carbon Fiber decal stripe will give you the OEM factory appearance of the exposed carbon fiber hood option. Save thousands of dollars and enhance your new Corvette C7 with the latest in eye-catching appeal.